One of the things I love about occupational therapists is how creative they are. I guess they have to be because they are in the business of working on people's bodies and one size does not fit all. They modify everything to make it work for their patients. It can range from small actions like cutting a pencil into the golf club size to designing magical sensory playgrounds made to help kids do anything from calming down to building up trunk muscle tone. 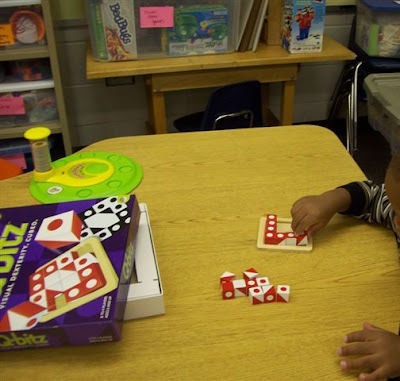 Aimee said that Q-bitz is great for bilateral coordination. I find bilateral activities to be calming for both me and Number 1 Son. You have a bunch of little cubes that have different images on each side. When turned and combined, it can become an image. Thus, the game is of a player seeing a one-dimensional image and recreating it with his hands. Sounds simple enough but then you have to remember that your opponents are doing the same thing and you have to get yours done first to win. It might not sound like an original idea to you but that is probably what makes it so special. The components of the game are so simple, you can pretty much do whatever you want. Heck you can make up your own game. And when you play again on another day... you can play it a different way. If you are really good at it, then it's almost like you're morally obligated to challenge yourself harder and to teach others how to play better. If you want the speed without the competition, you can just use a timer. My youngest loved being timed (timer not included*). Notice that the images are on a 1:1 scale with the cubes (in a one-dimensional way). That's great for the little ones! Position in Space: Oh, this one is big here. You have more chances of winning if you have a sharper sense of where everything should be. There are 16 cubes per each "plate" or player (Aimee thinks more than one player can use one set of cubes- yeah teamwork!). Basically, in each round, you are deciding where all 16 cubes will be and you have to decide fast! Of most importance, Aimee believes that these are precursor skills to reading maps and even things like letter orientation (b and d). Wow! There is so much more but we will have to wait until we review Q-bitz Extreme to learn about all the additional skills. Yes, there is a sequel. Actually, it's the sequel's sequel because Q-bitz came up with a 100-card extension pack and now there's also a whole new game of Q-bitz that features curvier lines that will likely leave me cross-eyed but if you have a child that just loves this kind of game, then you can start out with Q-bitz and keep building interest with the add-ons and the new sequel game or you can make a huge gift and give all three together for the holidays. I think that is such a classy gift, don't you? I would also like to stress what Aimee said about how different ages can play together. Thus, I think that an extension pack or additional game might be nice. I really like how some cards are harder than others. I think that gives us parents who are trying to keep the family together, a little support since I can pre-select an easier card for my little guy and a harder card for my older one. With different cards, we can still use the speed factor to motivate us. Lastly, they are still, just blocks and blocks are fun. 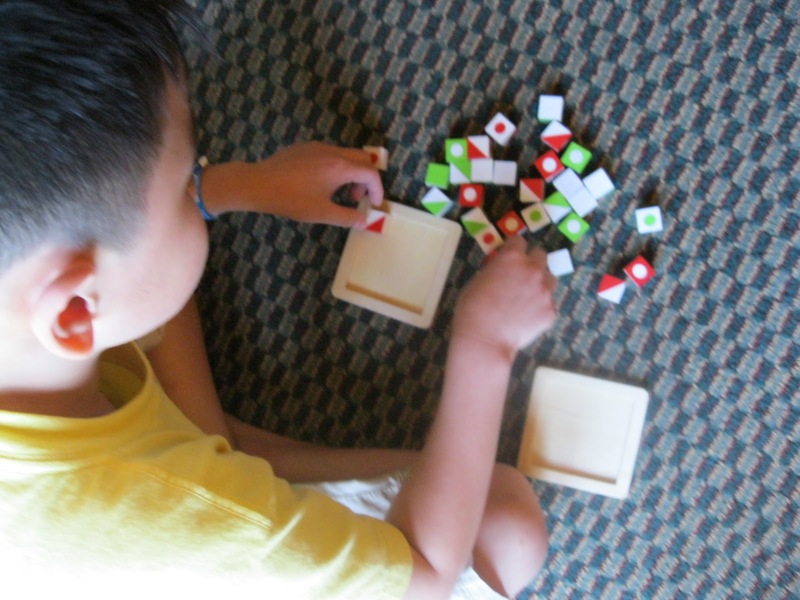 "I like the size of the cubes because they’re small," Aimee told me. "Everybody goes after the big chunky cubes because of the way their (kids) hands are but the reality of it is, you need the smaller stuff to get the refined work." My younger son likes the size of them too. In a way, they appear less intimidating. 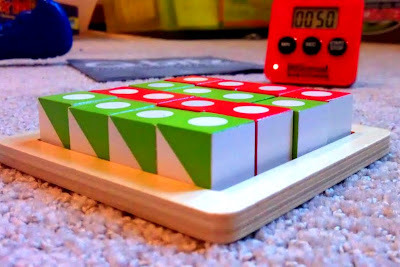 They can manipulate the sides of the cube much faster since it is small. My kids have also stacked them and made trains and made different designs using different color blocks. I was not expecting this game to be a toy but it is! NOW it's time to win your own Q-bitz!! It will be shipped to addresses only in the U.S. Follow the directions! I need your thoughts as they help me steer the direction of Toys are Tools better. Here is my Amazon link below. Disclosure: Toys are Tools has not been compensated by any company to release this information. 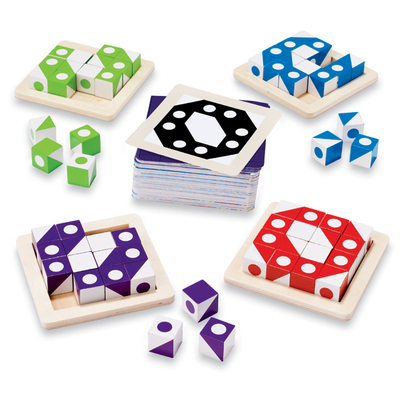 A review unit was sent to Toys are Tools and an expert solely to facilitate a review. Reviews are never promised. I didn't even think about this as an OT tool. My three children have Essential Tremor. They all have it to varying degrees, however my daughter Maggie has it the worst. This is something that will never go away, and will get worse. She goes to someone in school for hand eye coordination, as well as OT and PT. It effects her everyday life, so anything we could do for her that doesn't look like therapy would be great. This product looks like so much fun and would still help her. I would love to win this for her, and my other children. 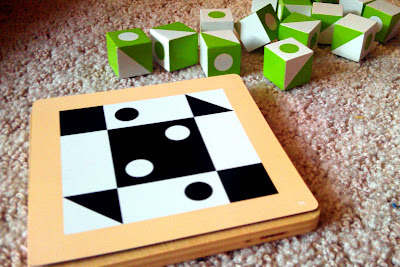 I love visual games like this that can be played alone or with someone. The sequencing is also a great help with math problems. Overall this looks like a great game. Thanks for featuring it. 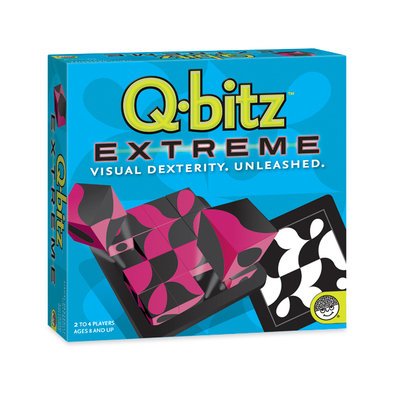 The Q-Bitz extreme looks more fun and challenging.